The media is reporting that Pope Francis said that there is no hell and that sinful souls just "disappear." The pope is alleged to have stated this to atheist journalist Eugenio Scalfari, a 93-year-old atheist communist who founded La Repubblica newspaper, a leftist paper. According to Scalfari, when he asked the pope about "bad souls," the pope replied stating that bad souls that do not repent simply disappear and that there is no hell. Scalfari is an atheist Communist Italian. "They are not punished, those who repent obtain the forgiveness of God and enter the rank of souls who contemplate him, but those who do not repent and cannot therefore be forgiven disappear. Eugenio Scalfari of @repubblica, a friend and frequent interviewer of Pope Francis, reports today that the pope said people who die without achieving eternal salvation "are not punished ... There is no hell, there is the disappearance of sinful souls." Immediately "Rorate Caeli" and other right-wing gossip blogs began to attack the pope as a heretic, senile accusing him of destroying the catechism. They did not even bother to verify the story or what the pope actually stated. These sites are so bent on slandering and attacking the Holy Father that they set aside good journalism in favor of propaganda and fake news. According to the Vatican spokesman Fr. Thomas Rosica, this "interview" was not even an interview. The atheist journalist requested a private meeting with him and clearly took advantage of the situation. He has a tendency of not taking notes and of simply quoting people from memory. Remember, he is in his 90's. This speaks volumes of his memory and cognitive abilities. The Vatican issued a statement saying that Scalfari's article "is a product of his own reconstruction in which the actual words pronounced by the pope are not cited. No quotes of the aforementioned article should, therefore, be considered as a faithful transcription of the Holy Father's words." Vatican statement says that Scalfari's quotations of the pope in today's report should not be "considered a faithful transcription of the Holy Father's words." No specific denials. 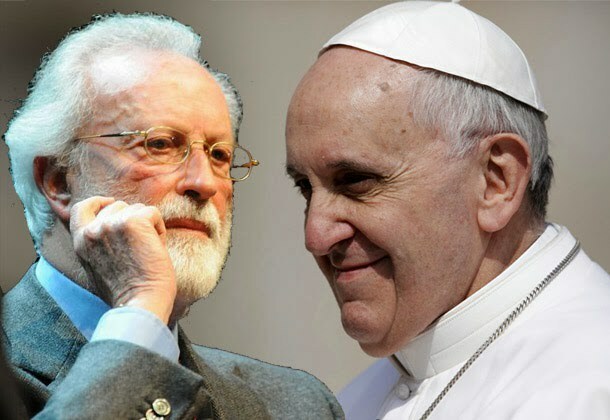 The Holy Father recently received the founder of the newspaper La Repubblica in a private meeting on the occasion of Easter, without, however, granting him an interview. What is reported by the author in today’s article is the fruit of his reconstruction, in which the precise words uttered by the Pope are not cited. No quotations in the aforementioned article, then, should be considered as a faithful transcription of the words of the Holy Father. This is not the first time that Scalfari misquoted Pope Francis. He did this in 2013 and removed an interview he conducted and then reposted it only to remove it again. From experience as a former atheist, atheists cannot be trusted when giving accounts of religion or religious persons. They distort things and post alternative facts in order to make a religion or religious leader look bad. 1033 We cannot be united with God unless we freely choose to love him. But we cannot love God if we sin gravely against him, against our neighbor or against ourselves: "He who does not love remains in death. Anyone who hates his brother is a murderer, and you know that no murderer has eternal life abiding in him. "610 Our Lord warns us that we shall be separated from him if we fail to meet the serious needs of the poor and the little ones who are his brethren.611 To die in mortal sin without repenting and accepting God's merciful love means remaining separated from him for ever by our own free choice. This state of definitive self-exclusion from communion with God and the blessed is called "hell." 1035 The teaching of the Church affirms the existence of hell and its eternity. Immediately after death the souls of those who die in a state of mortal sin descend into hell, where they suffer the punishments of hell, "eternal fire. "615 The chief punishment of hell is eternal separation from God, in whom alone man can possess the life and happiness for which he was created and for which he longs. 610 1 ⇒ Jn 3:14-15. 611 Cf. ⇒ Mt 25:31-46. 612 Cf. ⇒ Mt 5:22, ⇒ 29; ⇒ 10:28; ⇒ 13:42, ⇒ 50; ⇒ Mk 9:43-48. 615 Cf. DS 76; 409; 411; 801; 858; 1002; 1351; 1575; Paul VI, CPG # 12. 617 LG 48 # 3; ⇒ Mt 22:13; cf. ⇒ Heb 9:27; ⇒ Mt 25:13, ⇒ 26, ⇒ 30, ⇒ 31 ⇒ 46. 619 ⇒ 2 Pet 3:9. 620 Roman Missal, EP I (Roman Canon) 88. Pope: "The fool says in his heart, 'there is no God.'" Scalfari: "Pope: 'There is no God.'" Pope: "Christ seeks to save the lost." Pope: "There's no way in hell I should give you another interview." Scalfari: "Pope: 'There is no hell.'" Let us pray for our Holy Father who is always under attack. It is sad that many of these attackers are from his own flock. The pope is no heretic. He is a shepherd to reaches out to the sheep, even those outside of the Church. As a public figure, he will always be a target of slander and falsehoods. Do not believe anything you read or hear. Wait until the Vatican issues a statement. Is Stephen Hawking in Hell? Sacerdotus Named in Top 100 Catholic Blogs!